Best Practices – Best Practices will be rolled out company-wide at the end of 2018. The Committee of 5 has been selected and they will meet each month to discuss safe and effective methods of installation practices. Each month the committee will discuss a new scope, which they will develop and vote upon the submissions from their peers. These Best Practices will represent everyone who works at Clark Electric. We are very proud of our employees and their ideas. We encourage our employees’ feedback and empower them to work as a collaborative team. Core Values – Being in business for nine years strong, we have developed 5 Core Values that represent who Clark Electric is; Accountability, Trust, Safety, Quality, Culture. “Plug” Awards – The “Plug” Award was created for the employees of Clark Electric to nominate each other for exemplifying our core values: Accountability, Trust, Safety, Quality, and Culture. 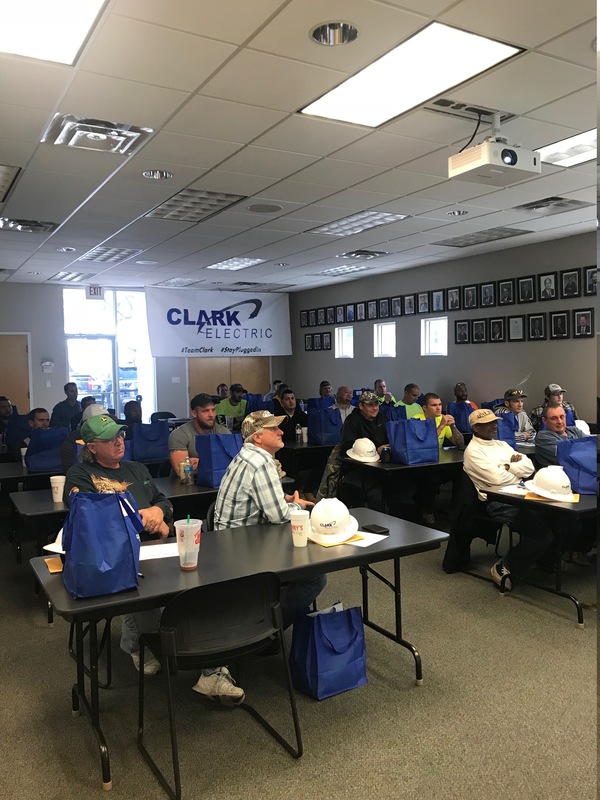 Each core value sticker that an employee receives to showcase on their hard hat represents that employee being “plugged-in” to the values of Clark Electric. East/West Shrine Game – Clark Electric was proud to be a part of the 2018 East/West Shrine game in January. Created by the Shriners in 1925, the East-West Shrine Game was the nation’s first college all-star football game. This game is driven by the desire to support Shriners Hospitals for Children in its mission to help children in need of expert medical care. More than 1.3 million children have benefited from Shriners Hospitals’ unique way of providing hope and healing, regardless of the families’ ability to pay for services. Employee of the Year – This award was given to the employee who exemplified all of Clark Electric’s Core Values throughout the year. Accountability, Trust, Safety, Quality, Culture. We are certainly looking forward to a fantastic 2018 for Clark Electric! As our team continues to grow, so do our goals and vison for the company.